The division of estates created the lordship of Useldange around the year 1100. The first Lord was Theobald of Useldange and his wife Azeka. This dynasty became extinct around 1250. John of Rodemacher becomes the legitimate lord of the manor by his marriage to Irmgart of Boulay in 1415. Due to intrigues in the course of the war between France and Burgundy the Rodemachers didn't survive for long. Maximilian Ist confiscated Useldingen in 1479 and handed it over to Christopher of Baden. As a result of these upheavals, the castle and chapel suffered serious damage. William of Nassau-Vianden inherited the stronghold only to sell it to François Sebastian Bauer of Everlange in 1674. There follows a period when the feudal castle falls into total ruin ending up as a stone quarry. The chapel was demolished in 1903. Mrs Kuhn-Wolff, a native of Useldange who had emigrated to the United States at the age of 18, purchased the ruins in 1924 and returned to Useldange to renovate the castle. Although the new owners started strengthening the walls and the keep, they did not respect the original architecture and by 1934 the large entrance gate and palace were replaced by a modern villa which is used today as the town hall. 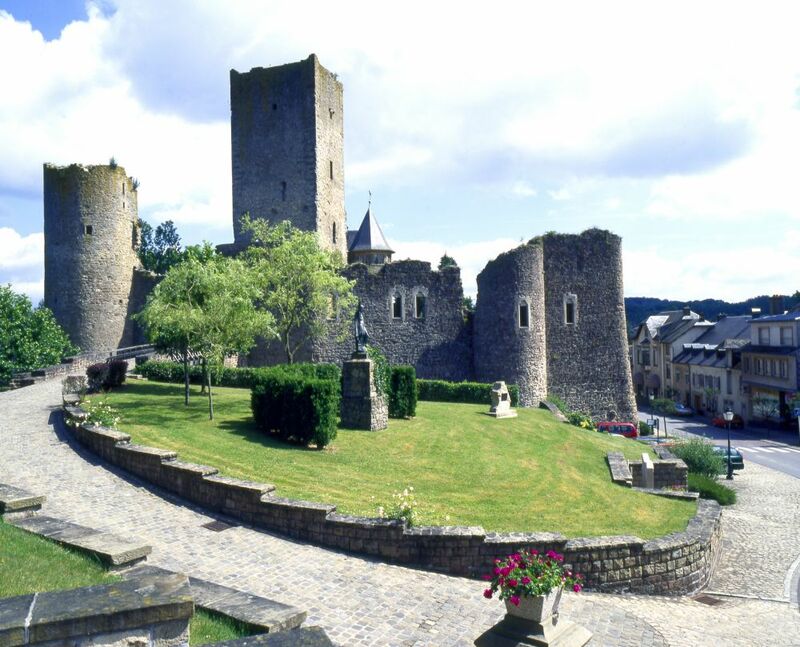 At present the castle is being restored by the “Administration des Sites et Monuments”. A trail for partially sighted visitors is being set up under the patronage of UNESCO. It leads around the castle and inside the tower and presents local culture in twenty stages. The partially sighted are literally offered the opportunity to feel, hear and touch History. The cultural itinerary also aims to present the local wildlife and integrates the aromatic herbgarden to encourage visitors to discover the great variety of local plants and herbs - well marked by specially designed pannels for partially sighted visitors.